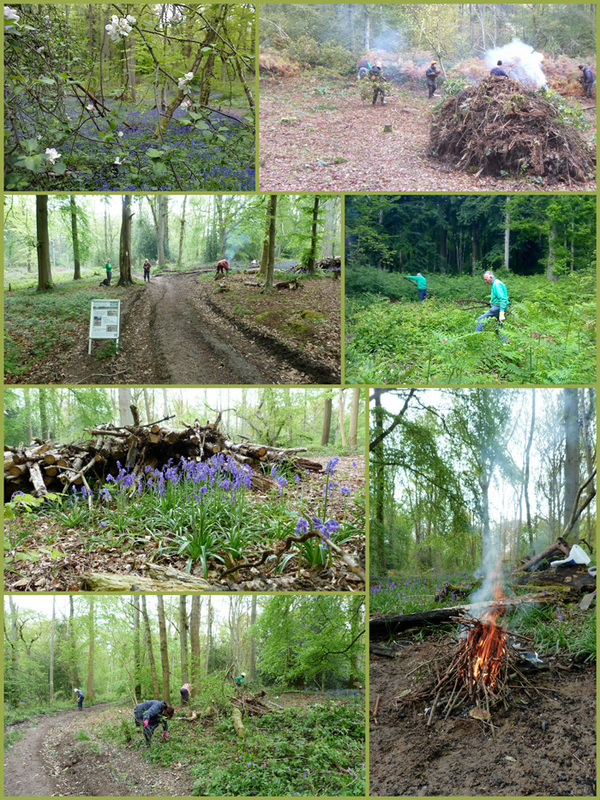 In August 2012 the Sonning Common Green Gym commenced work at this attractive and popular site. Green Broom Wood was purchased by Sir Charles Henry Rose as a gift to his wife Phoebe in February 1944. It lies a couple of miles north west of the Rose family seat at Hardwick House (in the parish of Whitchurch) and may once have been part of the (then much larger) Hardwick Estate. A public footpath runs through part of the work area. It is an area of 21 hectares of mixed deciduous woodland, within which mixed conifers were planted as a commercial crop in 1946. The conifers were harvested a year or two ago, leaving gaps in the canopy and some of the wood still lying around in the undergrowth. Our task is to clear the branches and the brambles that have grown up in the open spaces where the conifers have been removed, to encourage natural regeneration of broadleaved trees. The wood contains a fair amount of hazel, which we are coppicing to ground level while leaving the sap-risers (stems of less than a thumb’s thickness). We are also removing the holly which appears in various places. The waste material is either stacked or burnt on one of our regular bonfires. We are working steadily through the wood in an easterly direction up to Eastfield Lane using mainly slashers and loppers. Parking is on a hard standing area off the B4526 a short distance to the south east of Cray’s Pond. Update: 12 November 2013 (WK).